Congratulations! 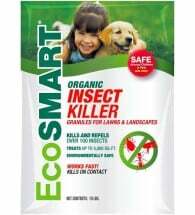 You’re no longer using chemical pesticides, herbicides and fertilizers. Now, how do you maintain your lawn without weeds? When David Quammen was young, he decided that mowing was actually a Communist plot devised by Khrushchev to keep American boys from more worthwhile pursuits, or so he claims in “Rethinking the American Lawn.” Warren Schultz, in contrast, titles a chapter of his book “The Art of Mowing,” and advises mowing higher in shady areas than in sunny ones (so there’s more grass blade to feed the roots) and other ways to fine-tune your mowing technique. People figure that the shorter they cut their grass, the longer it will be before they need to do it again. Well, yeah; but your grass will be a lot less healthy, and the actual mowing will be a lot more work. Mowing is actually hard on grass. Every time you do it, you’re cutting off any seed-heads that might be forming, so you’re preventing the grass from reproducing. You’re also chopping back the plant’s photosynthesis laboratory, its leaves. Grass blades, like all leaves, convert sunshine into sugars which then get converted into starches and stored in the roots. Cut the grass short, and you drastically reduce its ability to perform photosynthesis. 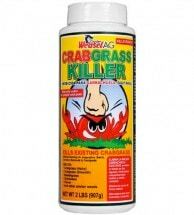 That weakens the grass, roots and all, making it more vulnerable to weeds, pests, and diseases. 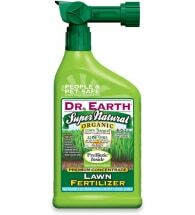 With the right lawn care products maintaining your organic lawn is easy! Planet Natural has everything you need​ — from fertilizers to weed control — to promote lush, green turf. ​Got bugs? Visit our Pest Problem Solver for pictures, descriptions and a complete list of earth-friendly remedies. Tall grass is healthier in itself, and it gives weeds less purchase. Short grass allows weeds plenty of space to soak up sun. They’ll grow like – well – weeds. Keep the grass long and tall and it will curb weeds, simply by shading them out. 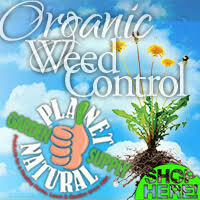 Weeds such as dandelions tend to spread out horizontally, which means that they are less damaged than grass by mowing. A mower can slide right over a mature dandelion — but only if it’s in thin or very short grass. Thick, long grass will not allow a dandelion’s leaves to lie down horizontally, but will force them upright. Now when you mow, the mower will damage the dandelions as well as the grass. It won’t kill them — but at least it gives them a set-back. If cutting grass long is good, then it might seem that letting it grow super-long between cuttings must be even better. Not so. Longer grass is harder to cut cleanly, so it tends to get more damaged when you finally do mow. Each bruised or mangled blade is a potential site for the entry of a pathogen. Furthermore, the greater the percentage of a grass blade that you remove, the greater the shock to its system. When you cut a six-inch blade of grass back to three inches, you’ve cut in half its ability to photosynthesize sugars. That’s bound to be a blow. Mowing very long grass creates other problems as well. For one thing, it doesn’t work as well, as anyone who’s tried it knows. Long grass sometimes just lies down in clumps before a mower, refusing to be cut. It’s also far more work. Removing one-third of the grass blade is far easier than lopping off three inches. Finally, the clippings from a delayed cutting can be so long that they will not slip easily between grass blades, but instead will lie about on the surface of the grass in clumps. These clumps of yellowing grass tend to be the sort of thing frowned on by the neighbors. Even worse, they can damage the lawn, shading it so heavily that it turns yellow as well. All of this (I hope) serves to explain why mowing high but often will be best for your grass and probably easier for you as well. If you don’t get it by now, do NOT pass Go, and definitely do not collect two hundred dollars. Lawn clippings are an enemy of landfill, where they take up more than their fair share of space, but they are your lawn’s best friend. When you mow, leave them be. “Recycling” your grass clippings, a.k.a. grasscycling, gives your lawn needed organic matter and nutrients, and saves you time. 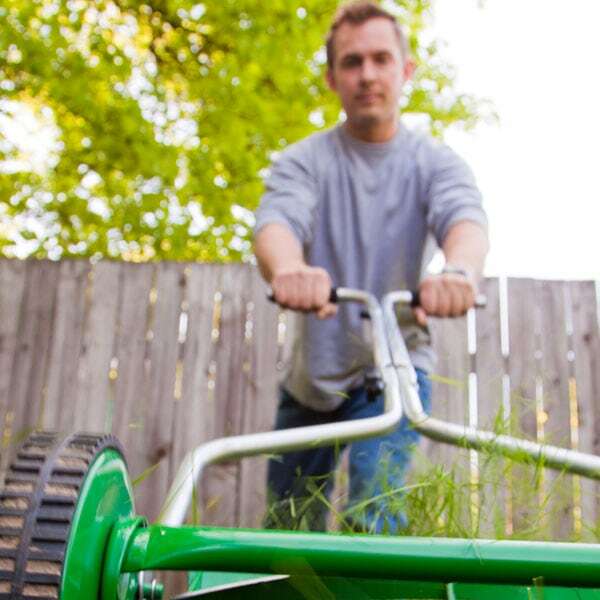 (According to most experts, mowing and raking are the most time-consuming and expensive aspects of yard maintenance.) Grass clippings can reduce the need for watering, reduce or eliminate the need for fertilizing, and help prevent common turf diseases. People often worry that they’ll get clumps of dead, cut grass that will impede the growth of their lawns. Provided you don’t mow your grass too short (or wait too long between mowing), this won’t happen (see Don’t Bag It). Mowing when the grass is dry also helps ensure that the clippings will scatter evenly rather than clumping. As long as your thatch layer isn’t too deep, the clippings should just disappear within a day or so of mowing, sifting down between the grass blades to decompose gradually and invisibly. The smaller the clippings, the more quickly this decomposition occurs. A mulching mower aids the decomposition process by chopping up mowed material into tiny fragments. With a mulching mower, leaf-raking can become a thing of the past, as long as the layer of leaves isn’t too thick. Just mow over them and let them decompose alongside your grass clippings. If the leaves or clippings are too heavy or wet to be mowed, they do need to be raked up. When they’re left whole, they decompose so slowly that the grass will die underneath them while they’re at it. But all is not lost; stored in an out-of-the-way corner, they’ll make excellent mulch and compost in later years. Provided your lawn is of a manageable size and neither too hilly nor too weedy, push reel mowers are the best choice for the grass. It’s obvious that using a push mower is better for your ears, your muscles, the environment, your wallet, and your relations with your neighbors than mechanized ones, but better for the grass? Like honesty and hard work, the Scotts® Reel Mower is an American classic. Produces NO toxic fumes for the environment to absorb… just a couple of footprints in a beautifully cut lawn. Snap on handle requires some assembly — wing-nut system eliminates the need for tools! The answer lies in the mechanics of the blades. Hold a piece of string so it dangles from the fingers of one hand, and try to cut it by swinging a knife against it with the other hand. Even with a grass blade in place of the string, chances are that the knife will slide over the grass, or at least nick it before cutting it. Now try cutting it with a pair of scissors. No problem, right? The vast majority of mechanized mowers use a rotary blade that spins at high speed. The only thing that causes the grass to be cut is its own inertia and the speed of the blades. It’s like swinging a knife. Rotary mowers therefore tend to tear rather than slice the grass-blades, leaving bruised tips which brown in the heat and which invite invasion by disease pathogens. A reel mower traps grass between the blade and a catch-bar, cutting it with a clean, scissor-like action. Well-maintained reel mowers therefore damage grass less, since they create an even cut that stays green and closes quickly. A huge or hilly lawn or one infested with heavy-duty weeds may make a push-mower impractical. But if you reduce the size of your lawn, get rid of the weeds, or replace some of the grass on the hill with a ground cover that doesn’t require mowing, then a push mower may again become a practical choice. 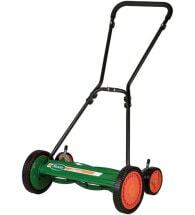 If you haven’t used a reel mower for years, you may be surprised to find that it isn’t nearly as tiring as you expect. Hummocky ground, very long grass, or dull blades can indeed make pushing a reel mower a miserable chore. But on even ground, over grass no more than six inches tall, and with a well-made machine in good repair, reel mowers can be as quick and easy to use as mechanical ones. Though they do require more energy to push than self-propelled machines, they are far lighter and more maneuverable, so in areas with many plantings or tight turns, push mowers can actually be easier to use than mechanical ones. There are other alternatives to gas-engine mowers. Mechanized mowers now come in electric and solar-powered models. Cordless electric mowers recharge between uses and run far more quietly than gas machines. If you must go with a gas machine, keeping the engine well-tuned will help reduce gas consumption and emissions. Regardless of what type of mower you buy, remember to keep your mower blades sharp and clean. 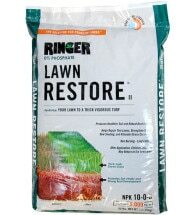 That will put less stress on your grass and make for a healthier lawn. It sounds crazy, but the best way to promote a luscious lawn is to water infrequently. Improper watering means that much of the water applied to lawns across North America never gets absorbed by the grass. Instead, it runs off or runs through because it’s applied too rapidly, too often, or both. Water runoff not only wastes a resource, but it can also carry away fertilizers and pesticides, which then pollute streams and lakes. According to the EPA, the primary pollutants in Chesapeake Bay and other East coast estuaries are nitrogen and phosphorus from fertilizers. Here’s a rainwater collection system that’s no-fuss — with a touch of magic. 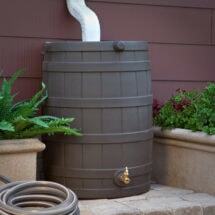 The Rain Wizard 50 gallon rain barrel captures runoff from your roof and stores it for a not-so rainy day. When your garden needs the extra moisture, just hook a hose to the brass spigot. So being lazy – AKA watering infrequently – can protect the environment, your grass, and your pocketbook. However, it is important to water deeply and slowly when you do water. Slow watering gives the soil a chance to absorb the moisture, and damp soil, like a damp sponge, absorbs more moisture than dry soil. Deep watering (at least six inches deep) trains your grass roots to go deep, thus making your lawn more resistant to drought. Conversely, frequent but short waterings will encourage the roots to grow close to the surface, which means your lawn will be hurting during any dry spell. If those aren’t enough reasons for mending your wicked watering ways, consider this last problem caused by shallow, frequent watering: it encourages thatch. Don’t wait until the grass actually turns brown. Instead, watch for it to curl, or for it to hold the shape of your footprints as you walk across it. Both of these signs indicate that the grass needs water, well before it is actually stressed. You want it to be thirsty, not dehydrated. It’s best to water first thing in the morning. Watering in the evening often leaves the grass itself wet overnight, conditions that may promote mildew and the fungi that cause most turfgrass diseases. Watering in the heat of the day leads to excessive evaporation in drier regions — which is not only wasteful, it’s inefficient, since some of the water you intended for your grass is instead humidifying the atmosphere. If you can’t water early in the morning, your best option differs depending on where you live. To be precise, it depends on whether you live in a dew-prone area or not. If you live in a drier area where there’s not much dew, try to time your watering for that window in the late afternoon when the worst of the day’s heat is over but enough warmth remains so that the grass stems will dry before nightfall. If you live in a more humid climate where dew is heavy, then one school of experts says you should actually wait until after dew has fallen to water in the evening. According to Gil Landry, Jr., of the University of Georgia’s Cooperative Extension Service, research shows water losses at night from irrigation are 50 percent less than from midday irrigation. Studies also indicate that irrigating after dew develops on a turf will not increase disease problems. However, irrigating prior to dew formation or after the dew has dried from the morning sun and/or wind extends the period of free surface moisture and may enhance disease development. In other words, if you live in a Dewey area, water at night when the grass would be wet anyway. If you live in a dew-free area, water in the late afternoon so the grass has a chance to dry before nightfall. Delivers NINE patterns of water with a quick-click of the dial. 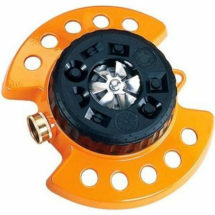 The ColorStorm Turret Sprinkler provides an incredible amount of flexibility when watering the lawn. Available in FIVE vibrant colors and includes a heavy-duty metal base for increased stability. If your soil is very dry or very hard, water a bit, wait an hour, then water deeply. 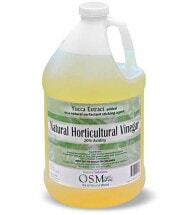 This gives your soil a chance to soak up the moisture and become more absorbent. It may seem downright perverse to water the same day it rains, but piggybacking on a light natural rainfall has the same effect as the second, deep watering after an initial sprinkling. Different soil types require different watering schedules. For example sandy soils, which don’t retain moisture well, require more frequent but less thorough watering, while clay soils should be watered less often. The age of your lawn also plays a role. 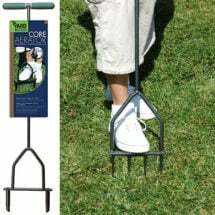 A new lawn, with its young, shallow roots, needs more frequent watering than an older, established one. In general, you’ll need to water more for the first three years after planting or landscaping. Then you can taper gradually until you reach the level that makes sense for your grass type and region. Different grass types need watering at different intervals. To get an idea of the range, consider that Bermuda grass needs to be watered every fourteen to twenty-one days, St. Augustine every twelve to eighteen, and Zoysia grass every five to seven. That gives you a range of between five and twenty-one days — and that’s only looking at a few of the most common southern grasses. Find out what you’ve got and how frequently it needs to be watered. Oh yes, and don’t forget all that other stuff above about soil type and so on. Once you know the range for your grass, factor in information about your climate, soil type and lawn conditions to determine at which end of that range you fall. For example, if you learn that the grass you have should be watered every eight to twelve days, and you know you have very sandy soil, you know you’ll probably be watering about every eight or nine days — seven or eight if your lawn is only two years old. Ah yes, weeding — everyone’s favorite summer activity, right up there with being staked out in the hot sun on top of a fire ant mound. Weeding is so roundly despised for two reasons: it feels pointless (there are always more dandelions), and it’s often uncomfortable. There are ways to mitigate both these conditions, but it’s important to take stock first. 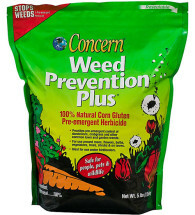 Here’s your best weapon in the War on Weeds. 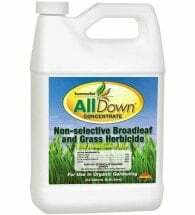 AllDown® Organic Herbicide — a 20% vinegar weed killer, plus citric acid — is the product to reach for when you’re tempted to give up or resort to chemicals. Created with organic-approved ingredients, this effective spray has been tested against the big-name products with great results. If you’re looking at a lawn that’s over half weeds, routine maintenance isn’t going to help much. It’s time for more drastic measures, which you’ll find under Long-Term Lawn Rehab. For routine problems, however, this is the place to be. You need to know what you’re fighting. Identify your weeds. If you’ve got dense patches in certain areas, use an organic herbicide or cover them with black plastic for several weeks and then reseed. Save your knees and wrists and patience for the areas where there’s enough grass to be worth saving. Tackling the whole lawn can feel overwhelming, but if you can put in ten or twenty minutes a day, you can beat back all but the worst cases. Start on one strip ten feet wide, and the next day, do another. On the third day, quickly go back over the first two areas to catch anything you may have missed, then move on. Day four, another strip, day five, review and move on. The “review” days give you a chance to catch new sprouts before they get established. When dealing with dandelions don’t let them go to seed! Even if you’ve only got time to snap off the flowers, do that. What makes weeding uncomfortable? The hot sun? Bending over? Getting up and down? Boredom? If you can pinpoint the problem, you can probably solve it. Having the right tools makes an enormous amount of difference. Make sure they’re easy to get at, especially if you often weed spontaneously for short periods of time. Perhaps put everything into one basket, so you don’t have to hunt around for things. If you don’t have a basket and don’t have time to think about getting one — life can be that busy — use a cardboard box. It won’t be pretty, but it’ll do the job. 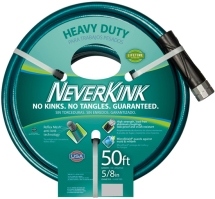 Weed-Popper: If you’re tired of going down on your knees before your lawn, try one of these. All let you weed from a standing position. 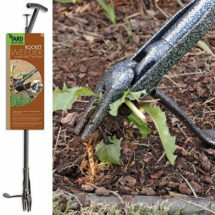 One is like a traditional dandelion weeder, only with a handle three feet long. Others have a set of prongs that will surround the offending item, close on its roots, and yank the whole thing loose. Kneeling Mat: A pad that saves the knees if you stick to the old-fashioned approach. If you’ve got two, you can creep from one to the next without ever having to stand up. Radio: If boredom is the problem, nothing helps more than a radio or CD player on a long, outdoor-extension cord. Weed in the Shade: Don’t work in the sun when it’s hot. Save the sunny parts of the lawn for evening or early morning.